It was let slip on 24th January that we would be facing a May 6th general Election and this will surely change everything, whoever gets into power. I don’t want to be a doom and gloom merchant by any stretch of the imagination as recessions have traditionally been a superb opportunity for well managed businesses to establish a wider market share and trade through, without their weakened competitors who fall by the wayside as economic casualties. According to Credit Action, the average owed by every UK adult is £30,226 (including mortgages), which is 133% of average earnings. There is also the small matter of how much has been loaned on our behalf to bail out the poxy bank, which runs into the hundreds of £billions and the £200 billion that has been spent quantitative easing. Well, from May onwards, we’re having to start paying for it through higher taxes and lower public spending, so I believe we will be facing our most austere era for many generations. My own family had a very successful soft drinks business based in the South east that was the main supplier through the war years. When the country emerged from war in 1945 it was seen as the drab/austere choice that had almost been forced on them for the last six years and people walked away in their droves eventually leading to it’s collapse in the 60’s. So what does all this mean for brands? It’s entirely what you make of it! By offering great value, better quality products that people care about. This is far more than just offering the cheapest price for a poor product as it is my opinion that in really tough times, people buy far fewer cheap products, they buy ones that they think will last and dispose of the discretionary purchases. How good can you make your product for the money, not how cheap can you get away with making it? We are in the perfect economic market, where we can all check the price against anyone else out there. If the product is identical, why does it matter where you get it from – as long as you can trust them. In the design market, there are now loads of ‘design firms’ with no designers. They have a front person (suit) who then subcontracts the work to whoever is available. Yes it saves money, but it is a sure way to introduce inconsistencies and slowly undermine brand equity. Like the Lyle’s example above, I guess my Grandad stopped innovating and let his company slowly die. People became bored, because the product became boring to them. A brand has to constantly evolve and introduce new touches, tweaks and ideas or people will have excuses to flirt with their peers. In this great article from Accenture, they point out that Companies that did really well in the last recession did not just cut costs — they cut the right costs. They diverted resources to activities that actually created value. Like I wrote last year when Woolworths waddled pathetically into financial obscurity through lack of effort and like any good Cub Scout would advise. I was in Liverpool at the weekend and as some of you will know, I am a huge fan of the City and the people. It was my birthday and rather than travel abroad for a few days, we decided to stay within the UK and immerse myself as a total tourist and I simply loved it. We went to Flanagans Apple for an early beer. This has to be one of the best Irish pubs anywhere. We then went on to lunch at the award winning deli restauarant called Delifonseca, where the food, the perfectly chilled Jever herb beer and the service were all superb. After checking in at the fantastic Hard Days Night hotel (like any good tourist should do), we went off to walk through the Met Quarter, down through Liverpool One and then back up to the Big Wheel that graces it’s huge plaza. This was in it’s last few days in Liverpool and is on its way back to Nottingham to arrive in Mid Feb.
Back off to the Cavern Pub (opposite the Cavern Club) and then a few minutes to relax before joining our family at Bar Four, for some overpriced cocktails, even more overpriced wine and scarily expensive Peroni beer. The evening saw us move onto the brilliant Italian (and quite huge) Zelig’s, where again the food and the service was brilliant. After dinner we got some VIP tickets for Palm Sugar to enjoy a bit of un-named celebrity company where we danced and jumped about for the rest of the night. I have to say that whilst I love Nottingham, I’m not sure that we could have such a night here. The genuine friendliness of the welcome in Liverpool was universal. The quality of the venues was exceptional and the sheer scale of the developments that are undergoing is breathtaking. Anyway, pics and more details to follow. I’ve been catching up with some of my Podcasts over the holiday period and this one by Jack Welch seemed to be good advice for all sorts of situations from MP’s expenses to any bad publicity your brand faces. In his PodCast on 31/10/08 The Welch Way, Jack Welch, the former CEO of GE explains what he thinks you should do if you are getting a mauling in the press. 1. Get the whole story out there immediately. Their job is to deliver the whole story and you can rest assured they will find it, whether you like it or not. 2. Be consistent in the way you tell the story to which groups. Don’t tell them what you think what they want to hear. These inconsistencies will be reported and you will be well and truly caught out. 3. Be proactive. Tell your story by taking it into your own hands. You can’t change the coverage to your liking, but you can get the last word via your own websites and blogs. As long as your site has a reputation for being truthful/soul searching rather than propaganda you can still win in the end. All of this applies to a news story as well as the way you manage any brand. Tell the whole story truthfully and consistently and you will win if the product is good enough every time they come into contact with it. I booked a flight this morning to go an join my family in Spain in the Summer and as it’s just me on my own, I thought I’ll just go for the cheapest available. It’s not for long anyway. It’s only a 2.30 hr flight. But when I went onto Skyscanner and saw the prices of both Ryanair and BMI Baby were almost identical, guess which one I booked? 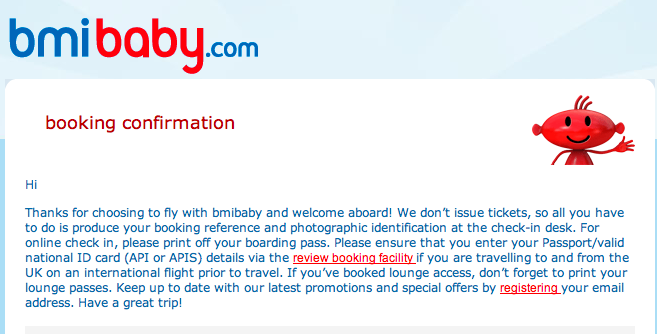 BMI baby was £93 and Ryanair £88. Yes, it’s BMI Baby for me. And whilst they tried to sell me a seat selection so I could stay with my group (at £7.99 per seat and £10.99 for extra legroom seats) that I’m not in, it was a far more open experience. I hate the Ryanair brand. It makes me feel grubby and they attempt to catch you out with every single policy they introduce from online check in to the choice of cards you choose. When I booked the flight for our ski holiday, I used Easyjet and the card payment cost me an additional £3.50. With Ryanair for the four of us that would have been £30 as I don’t have one of their prepaid chav cards to hand, which is the only way you can get out of paying a stinging credit card fee. Hmmmm. Brands that treat their customers that badly always fail in the end. The only good thing about Ryanair is that they are keeping the others keen with their pricing. Eight of the most irritating TV ads ever? I happened to see the TV ad for We Buy any Car last night and whilst it is incredibly irritating, it is one where you have to remember the domain name and know immediately where to look if you want to sell your car in desperation. I actually went on the site last night and went through the valuation process to be offered a value that equated to almost exactly 80% of the trade price of my car according to Parkers price guide. I may not forget the domain, but I reckon even I’d buy my car again if I could get it at that price. No wonder they will buy anything, they pay rubbish money for it – But as a last resort, I suppose they have their place. I got to thinking that TV advertising itself has become a whole lot more desperate too, with two appalingly repetitive examples around on our TV’s as we speak. The simply dreadful ‘Go Compare‘ with the chunky flying singer just saying the domain name over and over again. And the equally irritating Compare the Market ads. Whilst they are hateful, I do again, remember their domain name, so they are working. There was a new entry for me this Christmas with perhaps the most shite ad ever produced for Safestyle. The people behind this should be ashamed of themselves. I hope it worked for the client, because it doesn’t seem to do a huge amount of good for the reputation of the advertising and design industry. And then three absolute classics through the ages, which probably go to prove that there have always been a few really annoying ads that we all remember, the first of these is our old favourite Cillit Bang with Barry Scott. Its a bit of a low res version but as far as I can tell, it’s one of the oldest around on the net, from when Barry was a boy. Enjoy. And another all time favourite. If I say ‘Oh Ambassador you’re spoiling me’ you’ll probably know who it is. One of the worst dubbed, internationally transplanted ads ever made, but again, one we all still remember. Does that make it a success? I guess it probably does. And to end on the ultimate. The irritating ad that gave birth to the entire genre. Shake and Vac. Sit back, enjoy and smell the freshness of your carpets washing over you. If there are more irritating ads out there at present, or of old, i’d love to see them and add them to this compilation. I saw this film last night and I have to concede that it is a touch of genius. They’ve taken an irritating idea and built a real brand around it. I can see this story running and running and being the ‘Shake and Vac‘ of this generation.